History - Bentley's Antique Auto Service, Inc.
Lots of people ask me the same question... How did you get started on Model A Fords? I have always loved to work on things, even as a child, I would take our toys apart to figure out how they worked. My brother still mentions this every Christmas. Anyway, I was always fixing the bikes in the neighborhood and repairing stuff around the house. So at 14 I was excited when a high school friend of mine and I got together and took over one of his grandfathers' chicken houses for a work shop. We would go around the neighborhood and look for dicsarded cars behind people's homes. We would ride our bikes over and ask the owners if they wanted to get rid of the cars. Many times they would give us the cars, or sell them to us real cheap, like $35-$50. I think we got a '56 Chevy, a '66 Chevy, '50 Chevy truck, '50 Chevy car, '62 Buick wagon, '62 Buick convertable, '64 Oldsmobile, '65 Plymouth, '67 Plymouth Belvedere, several Corvairs, and I don't know what all. I remember we had one good battery between them, so we would get one running, sell it for a couple of hundred dollars, and go buy another battery and more parts to fix something else. Some folks in the area would bring cars to us to repair and I also remember putting a new engine in a boat for someone. Anyway, when we were 16, we got cars of our own and the chicken house deal sort of fell away. So from 16 years old and on I kept more than one street car always trying to fix up or restore something. In 1994 I bought a 1965 Chevy truck and was trying to get it painted. A local shop was working on a 1930 Model A Ford Truck and we worked out a deal that he would paint my Chevy if I would help work on the Model A. While working on the Model A, I got interested in it and after driving it, I knew I had to find one for myself. 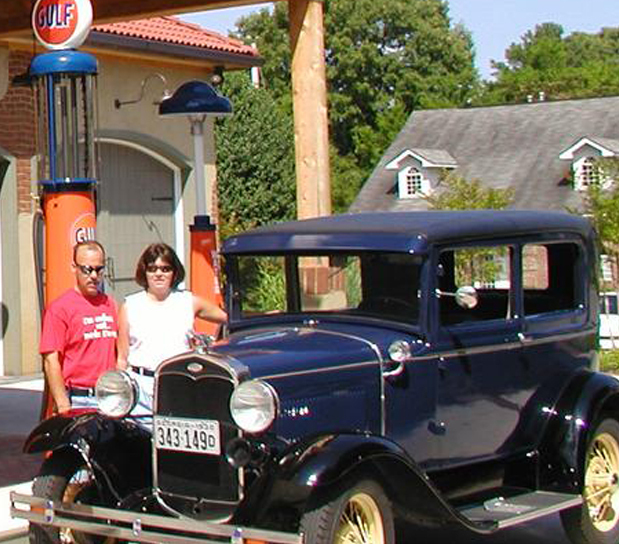 A few weeks later, we found a 1930 Tudor Sedan in a barn near our home in Dacula. It was dilapidated and needed a lot of work, but the body was pretty nice. I brought it home and took it all apart. Over the next year, I met Mike Butcher, of Mike's "A" Ford-able parts. The Tudor came out fine, and my wife and I still drive it regularly. Mike must have thought I was doing a good job, so he started sending customers to me. At first it was engine jobs and brake jobs, but it wasn't long before I had a customers' full restoration going in my small shop. This was all in the evenings, after work. That was in 1996. At the time I was working at a company called "Scientific Atlanta", as a machinist. That job was moved to Mexico in 1998 and after 20 years I was laid off. I figured I would work on the Model A's full time until I needed a real job. In 2006 we moved into a much larger shop in Maysville. I still haven't needed a "real job". Here is the 1930 Tudor that started it all.